In any country, but especially one as competitive as the United States of America, it’s a huge honour to be awarded the title of the nation’s favourite fuelling station. In their annual survey of attitudes to traditional gas stations and convenience stores, MarketForce conducts a study with 11,500 consumers, reviewing trends in food service, customer loyalty and technology, and then reveals who is winning the battle for US customer’s hearts and minds. Cumberland Farms, known colloquially as Cumby’s, won the top spot in the most recent report, and it’s easy to see why. The brand is a family business that has been around for over eighty years, and currently operates almost six hundred convenience stores across eight states in the North East of the United States. Backed by a long heritage in retailing, it is positioned as a contemporary brand with a clear focus on value and innovation. With revenues of over $6bn in its most recent financial year, Cumberland Farms is ranked in 64th place in the Forbes Ranking of private companies and here we review the commercial and technology innovations that have helped this regional retailer become the nation’s favourite fuel station chain. Cumberland Farms technology team has been led in recent years by Charles Jarrett whose focus on functionality yet simplicity led to his recent award as Convenience Retail’s Top CIO (Chief Information Officer). Joining the business just two short years ago, Jarrett realised that the legacy technology infrastructure required a comprehensive overhaul, yet the business also needed new ways to appeal to customers who were finding their loyalty app “a little stale”. Despite the challenging timeframes and scale of the task, the firm successfully updated the firm’s hardware and software platforms, while also re-launching their loyalty app called “SmartPay” which offers a compelling 10 cent discount for every litre of fuel purchased, along with additional rewards at various loyalty milestones for customers. Customers can download and use the SmartPay app free of charge. A plastic card is available to use the loyalty the programme if customers prefer. Customers using SmartPay automatically save 10 cent per litre of fuel purchased. For every fifty gallons of gas purchased, customers enjoy a free drink. Each member is given a free treat/reward on their birthday. SmartPay rewards include “Buy ten, Get one free” and free bonus reward coupons for ongoing tactical promotions and benefits. While many programmes offer similar benefits to customers, in our view, it’s the combination of the programmes generosity, with the main offer communicated so clearly that has helped customers understand and enjoy the app and its benefits. With these two essential elements, recent reports have estimated that customers have saved over $100 million in Smartpay’s five years of operation, as well as giving away more than 5 million drinks. It’s no wonder that as of August first 2018, the app had a 5-star rating on iTunes with more than 4,600 reviews! Watch the SmartPlay Video from Cumberland Farms. One of the most recent concepts launched by this innovative brand is a subscription-based coffee concept, called Cup-scription. The idea is currently on trial only in the Albany NY area, but if the simple approach and clear consistent messaging connects with customers in the same way as its SmartPay app, it seems likely to be rolled out throughout the entire store network. Customers pay a fixed fee of $25 per month for unlimited coffee-based drinks – either hot or cold. Drinks are included in almost unlimited quantities – up to one drink is available to claim every hour. Hot chocolate, hot tea and regular cappuccino drinks are also included. The package does not include speciality espresso drinks or smoothies. Cumberland Farms are offering subscription-based packages for hot and cold caffeine drinkers. 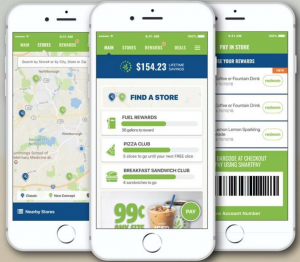 As well as simplifying and speeding up payment and saving money for customers, SmartPay is a clever cost-saving strategy for Cumberland Farms itself. SmartPay is set up to take payment from the customer’s checking (or current) account, so these mobile payments are significantly cheaper to accept and process than the credit card payments that are usually used in the US market. Detailed in the terms and conditions, Cumberland Farms explains to its users how the company can offer the generous discount on its fuel, citing the significant savings from reduced credit card fees which are an expensive solution for retailers and one that Cumberland Farms see a real opportunity to avoid. The SmartPay App allows both customers and Cumberland Farms to save costs on every litre of fuel customers buy. Cumberland Farms has built in two gaming strategies to address the concerns that the previous app was becoming “stale”. Launched in June 2018, SmartPay app users over the summer were automatically entered in to a “SmartPay Sweepstake” with three prizes of free gasoline for one year on offer. This adds an element of excitement to what is often otherwise seen as a grudge purchase by customers. In addition, Jarrett is considering the concept of a “commercial-quality game” that users could play to stay engaged with the brand, so we look forward to seeing future updates to the app that might perhaps include this concept. It’s no surprise to us that this simple, generous programme from Cumberland Farms is creating customers who are some of the most loyal in the industry. As well as their overall satisfaction with their most recent re-fuelling experience, Marketforce also researches each brand’s “net promoter” score – essentially their likelihood of referring the brand to others. They used the results to compile a Composite Loyalty Index score, and in the latest results, Cumberland Farms tied with “Kwik Trip” as a brand where motorists will choose to re-fuel almost exclusively when given a choice. When it comes to loyalty, Cumberland Farms is a fantastic example how the principles of simplicity, consistency and generosity can be applied to build a business that benefits both customers and shareholders alike. Chief Content Officer, Liquid Barcodes and Independent Loyalty Consultant.